True Paste • A tool for storing and quick pasting of frequently used texts. All text chunks in one place. You no longer need to store tens and hundreds of frequently used texts in various text files, search for the correct row, select it, copy and then switch to another window to paste the text. 15 text chunks for FREE! You can use True Paste for free if you need not more then 15 texts. Trial version is full functional version with 15 texts limit. No popups. No time limits. Easy to Find. Easy to Paste. All texts are organized with tags, making it easy to find the desired text. Type a part of the text to find it. 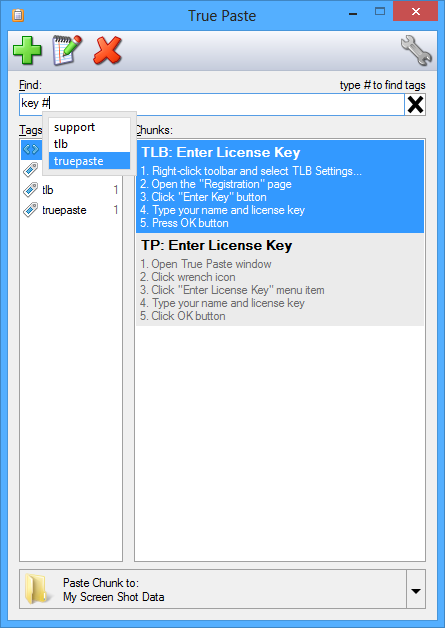 Select the text in the list and click Paste button, or press Enter. You can paste text into any window. Just select the window from the list and click "Paste" button. 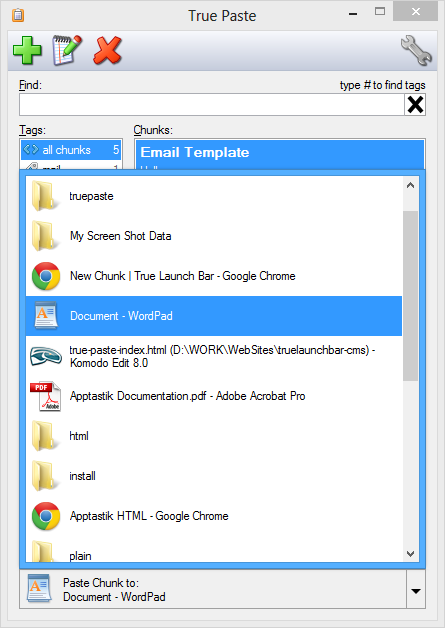 True Paste activate the selected window before pasting the text. Add the Keystrokes notation in your text to fill the forms. 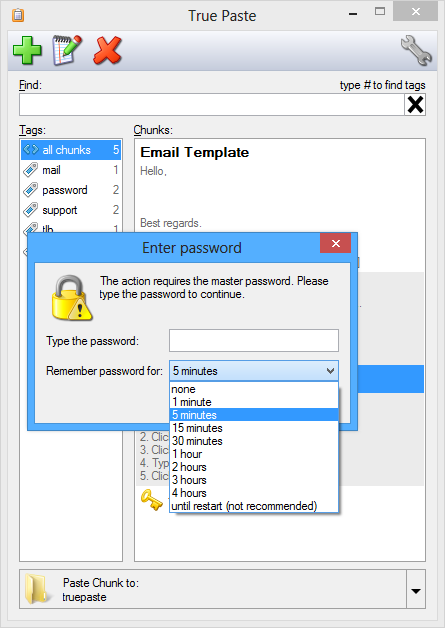 Usually the text login[TAB]password[ENTER] can be used for login forms on websites. Set the master password to encrypt the texts with sensitive information (passwords, private data, etc.). 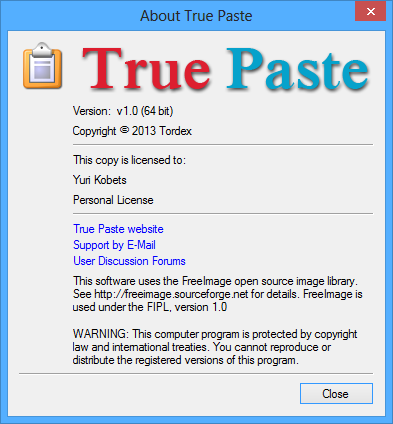 True Paste uses Twofish encryption with 256-bit key size. Please don't forget your password. The list of texts shows the title as well as the first 10 lines of text. You are always see the text you paste. The text of encrypted chunks is hidden. 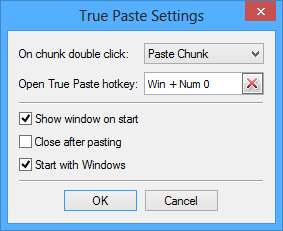 Set the hotkey for True Paste to access it quickly. Close True Paste window to hide it into system tray. Click the icon in the tray to restore window. All texts in one place. You can use True Paste in portable mode. Download the special portable archive or copy all files from installation folder to USB flash drive and create file named portable. 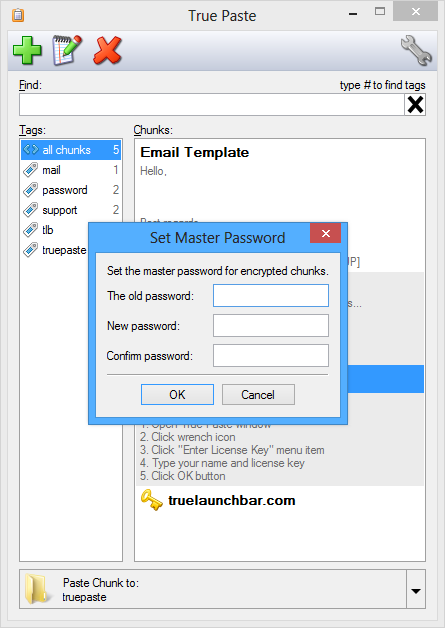 True Launch Bar - Superior replacement for standard Quick Launch. 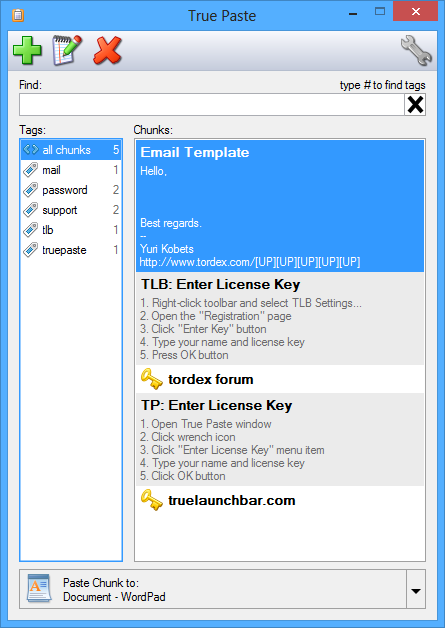 Free Launch Bar - Free replacement for standard Quick Launch. Text Accelerator - Tranforms selected text and insert text chunks. Tordex Wheel - add the intelligence to the mouse wheel. Start Killer - Removes Start button. Metro Killer - removes Windows 8 Metro Interface. © 2014 Tordex. All rights reserved.